When you call out to me and come to me in prayer, I will hear your prayers. I will make myself available to you,’ says the Lord. Today, we want everything to be available 24 hours a day, 7 days a week. Well, did you know that God is available at every second of the day. Yes, he is. We can reach out to God anytime and any day. No matter what time of the day, He is available to hear us. There are times our families need someone to listen to them. We may be busy. However, if we have taught them about God and the Bible, then we can delegate our listening to Him. No matter what it is, God listens to us. He listens to our heartaches, our accomplishments and triumphs, and all of our needs. He knows how to listen, answer, and comfort us. If you don’t have anyone to listen to your heartaches, take them to God. He has his doors open of communication at all times of the day. His door never closes for business. Through his door are his ears, waiting patiently to listen to us. He wants us to communicate to Him what our heartaches are. He wants to provide an answer, a solution, and comfort when needed. Tell Him what is ailing you. Let Him know you want his presence, His knowledge, and His wisdom. Let Him intervene and help you get through. Let Him hold your hand, or let him wrap his arms around you. Whatever it is, He will know how to make it better. Have you accomplished something phenomenal but have no one to share it with, then share it with God. Let him know how well you did, how hard you worked at it, and what a great outcome you had. Let him rejoice with you. Tell Him everything you did to get to that point. Tell Him every last detail you like to share. He doesn’t get bored. Actually, He is interested in you. Let Him smile with you. Let Him clap for you. Are you in need of help, financially, emotionally, or physically? It’s ok to let God know. He has the resources to help you with your struggles. Ask Him to help fulfill your need. Ask Him to provide for you, to give you comfort, or to guide your Doctors. 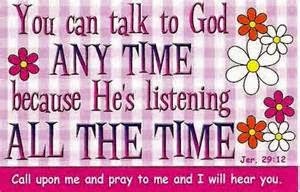 It doesn’t matter what the need is, converse with Him. Tell him you need help with your finances. Ask Him to help you with new sources of income, managing your spending, or getting a new and better job. Just ask him. Are you going through an emotional turmoil? Let him know exactly what it is. Do not omit any details. Tell him the truth about the whole ordeal. He will not judge you, nor forsake you. He will simply listen and answer your requests. Sometimes subtlety, others obviously. Either way he will answer. If you feel alone, then reach out to God. Let him walk with you and give you companionship. He is always available. Categories: devotions, god, time for God | Tags: Bible, Christian Woman, God, Jesus, Lord, Lord's Prayer, Prayer | Permalink. I’m sorry it has taken so long for me to reply. Sometimes I give up hope and stop looking. First, it is not my attention to dispute, dismiss, or disprove what you have said or what you believe. I only want to determine if and/or how I can internalize it or use it. To that end, I have a couple of questions. How can I quiet my mind when I am hurt and angry ? How do I let Him have control when I so frequently can’t get control myself. And how do I surrender my thoughts to him when I struggle so often with doubt that he is even there ? Is this figurative? It is a little ambiguous. I need to understand what these things look like in actual application. Any help you can offer will be accepted with gratitude.